A new exhibition starts tomorrow at the City Art Centre, showcasing some forgotten treasures from well known artists. Housed in the basement floor of the City Art Centre on Market Street the Hidden Gems exhibition brings together some of the venues lesser known objects from their 4,800 strong fine art collection. These pieces have rarely been seen in public and are now getting their time to shine. I got a sneak peak yesterday and loved the wide range of artwork on display, from both artists I knew and those I was unfamiliar with. This is the main reason for visiting a museum or gallery for me: to see the works you know up close but also to discover and learn about those you don’t. I love the idea of Hidden Gems and hope the City Art Centre continue the idea but rotate the objects. I left feeling inspired and also happy that these pieces were finally getting the acclaim they deserve. My watercolour above was drawn at the exhibition and shows a bronze in the foreground dated 1903, by Edinburgh born sculptor Ottilie Maclaren Wallace OBE, ARBS (1875-1947). The piece is entitled F.S. Oliver and is a portrait of her brother in law. 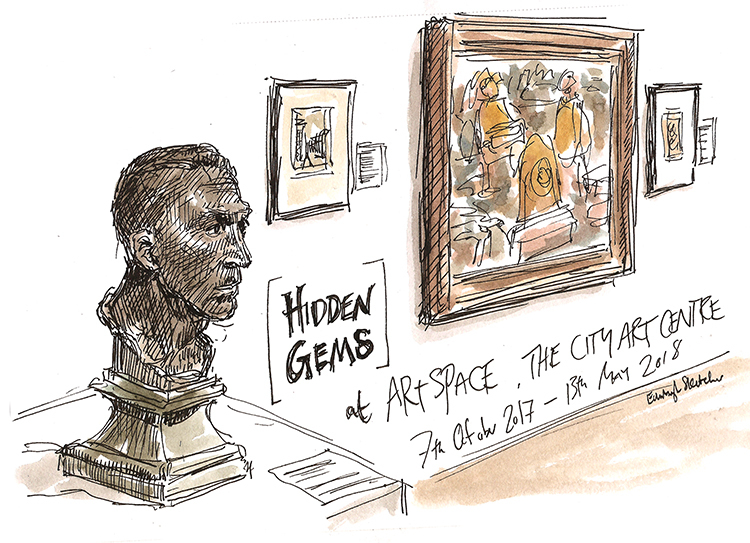 Find out more about the Hidden Gems exhibition (7th Oct 2017 – 13th May 2018) in the City Art Centre What’s On guide HERE.